During our progression it became quickly apparent that as well as installing electronic security and access control, the physical security is just as important. In 2001 energ.b. set up a small workshop and utilising Jansen profiles alongside our own bespoke profile created doors primarily installed as main entrances to apartment blocks. 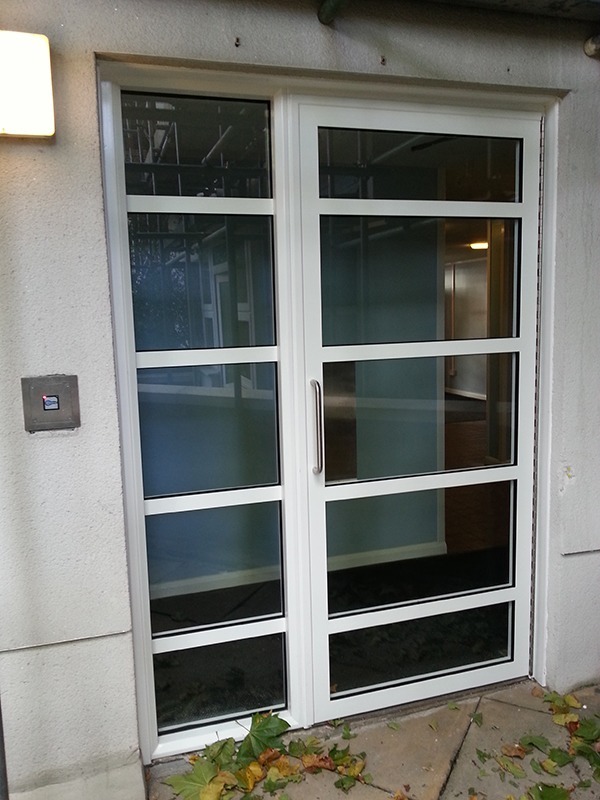 These doors were designed entirely with security in mind, making them strong enough to withstand unwanted attention but accessible to tenants and visitors alike. Over the years and through our relationship with Schuco Jansen our manufacturing facility has grown now encompassing two units here at College Business Park. We have to date fabricated all of the Jansen range of standard, thermally broken and fire rated profiles creating doors and windows in both steel and stainless steel finishes. Selecting windows and doors to achieve long life, be robust enough to withstand the rigours of modern life and yet still be pleasing to the eye is the main reason we specialise in steel and the Jansen range. The slim sight lines and large vents that architects so favour are easily achieved utilising steel due to its higher tensile strength.